Simon Benson writing in the Australian says Coalition close to a point of no return. In January 2001 John Howard was a dead man walking. Yet in November that year he won. Can Turnbull do the same? The poll Benson is talking about is the quarterly aggregate for October-December (can’t find it on the Newspoll site) which provides a big enough sample to look at more detailed demographics. The only good news is that in the 50+ group the Coalition still heads Labor on the primary vote. Everywhere else Labor is in front, even non-capitals 36-35. That’s primary vote, without preferences. In TPP terms Labor is ahead 55-45 in Queensland, 54-46 in NSW and Victoria, and 53-47 in SA and WA. The situation looks irretrievable. NSW and Queensland between then hold 87 of the 150 seats in the country. In Queensland alone the LNP currently holds 21 seats to Labor’s 8. On current polling that situation could reverse, dealing Turnbull a mortal blow. As politicians have found to their sorrow, when Queensland swings it often swings big, and the indications are that it has given up on the current government, has switched off and is no longer listening. Under these circumstances, Turnbull has two main strategies. The first is to kill Bill, to make Bill Shorten unelectable in the electors’ minds. It might work. Some think Mark Latham became unelectable after he famously shook Howard’s arm almost out of its socket. Shorten has now trailed Turnbull for 800 days in the ‘Better PM’ stakes, the quarterly aggregate coming in at 40-33 in Turnbull’s favour, but even that has closed from 42-26 this time last year. The Turnbull government tipped out to the media for Monday morning headlines a story that through its hard policy work it is cutting gross debt by $23 billion. It turns out that gross debt will not be cut at all, but will increase by $82 billion by 2020-21. By taking credit for Treasury’s changed projections about the state of the economy up to four years from now – projections that must be clouded with uncertainty – the government is continuing the practice of achieving a projected surplus by assumption. Instructively, of the 12 surpluses projected in various budgets since 2010 not one has materialised. Instead of handing over 14.9 per cent of their income after low starting rates and the tax-free threshold, middle earners will find themselves handing over 18.1 per cent. Within four years. It’s the result of bracket creep, and the increase in the Medicare levy. And the projected return to surplus in 2020-21 depends on it. The government’s forecast in May of a return to budget surplus by 2020-21 rested heavily on its prediction that, despite the extraordinary weakness in wage growth over the past four years, over the coming four years it would steadily return to boom-time rates. Now these highly optimistic expectations have been shaved back, but only a little. I hope they come to pass, but I wouldn’t bet much on it. Last year I detailed how Turnbull had degraded the political discourse into sloganeering and scare campaigns. 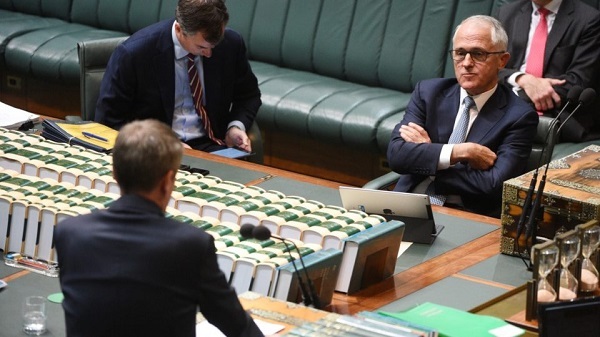 Turnbull never looks authentic when he starts laying down the law and shouting at his political enemies. Andrew Clark at the AFR tells us not to expect the “new Malcolm” or indeed the “old Malcolm” in 2018. His minions are spending the break cooking up ideas for the “tough Malcolm’. He will be tough on those Labor politicians who did not have their paperwork finalised before the last election, using his restored numbers to send them off to the High Court, but none of his own. 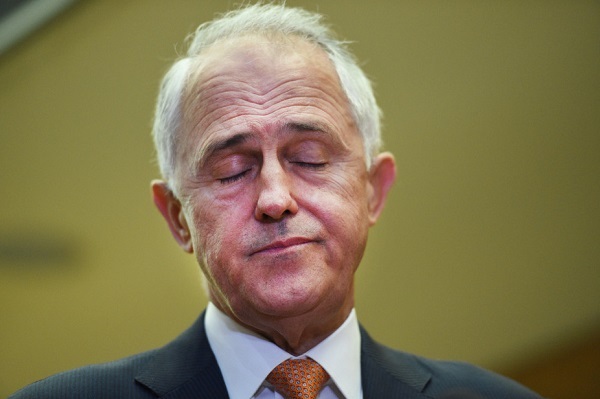 Australia’s ‘China problem’ is looming as the most imminent ‘tough Malcolm’ test. Ministers are bracing for a possible payback from our most crucial economic partner. Malcolm was helping out with Christmas lunch for the homeless. 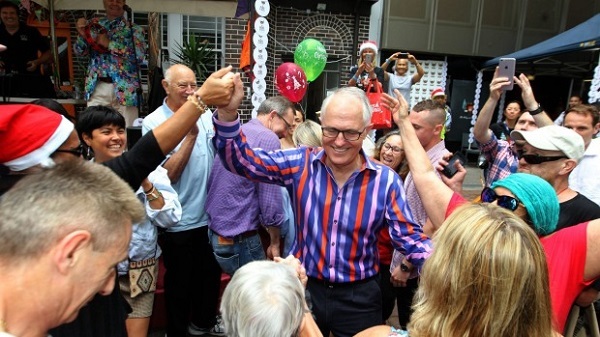 Someone unkind let it be known that he had paid $850 for that multi-coloured shirt! 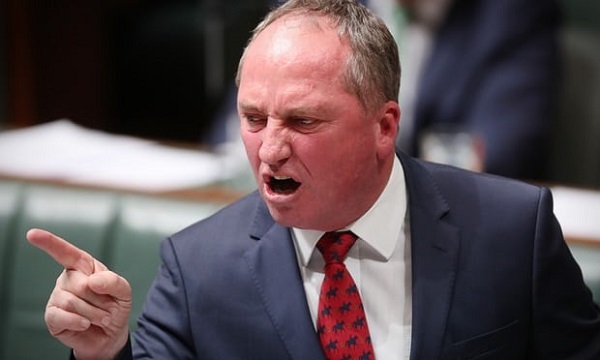 Recently Barnaby Joyce was saying that if you want to know what North Queenslanders think you need to go and hump bananas, like he really has. Joyce says he knows what will fly and what won’t fly with the people, like the Uluru Statement, for example, and often finds himself in disagreement with his cabinet colleagues. The real problem is that he can’t count. According to Essential Report he represents about 3 per cent of voters, or less than half represented by Pauline Hanson’s One Nation. Having got this one off my chest, I’ll do a Saturday Salon tonight. What Turnbull needs is a good attack dog. He is hopeless himself. Good morning, Brian and my fellow culprits. Rather than leading us to a strange place, Turnbull has allowed himself to drift along with the rest of us to a strange place. At a time when we need decisive political leadership, he squabbles and bickers and fiddles with trivia and tinsel. His lack of vision and decisiveness means we will all arrive in a strange and uncomfortable place – full re-colonialization – a lot sooner than otherwise. He did try standing up to the Chinese but that got him nowhere because the general public probably assumed that it was just another bit of political grandstanding, and so ignored it. The Chinese, of course, will never ignore it – though he must be useful to them in some ways, otherwise they would have had him sacked almost immediately. 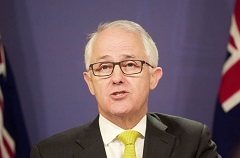 Turnbull would make a fine ambassador to Kenya or to FYR Macedonia. You are right, I fear. He’s like a barrister talking to a brief, and with no fundamental conviction. So who has he got? Barnaby Joyce, Christopher Pyne, Peter Dutton and up until now George Brandeis. His best bets are Julie Bishop, but does anyone take her seriously? and Matthias Cormann. I think he holds the whole show together. Graham, that’s a pretty fair assessment. Matthias Gormann is a man to watch. I can’t stand Mathias Cormann (regardless of how one spells his name). I can still recall the utter garbage that flowed out of his mouth in the Abbott dark period. No one can recover credibility after such putrid trash talk. “Its just politics” does not excuse it. Worse though he is still a full blood Climate Denialist who has no responsible place in Australia’s future or history. But feel free to watch him if you must. I couldn’t stomach the experience. Bilb: What I am hoping to watch in the not too distant future is a Bill Shorten prime ministership. I have been impressed with what he did in the ministries he held in the past. Howard did such a good job of driving out those who didn’t fit his right wing vision that the Libs may struggle to be contenders for quite some time. John, I have an uneasy feeling Bill will never make it. With Turnbull’s recent performance the polls should be 60-40 against him. In the last election Turnbull was steadily gaining ascendancy in the polls until Labor came up with the Mediscare thing. Other than that Shorten doesn’t often put a foot wrong and has the team working well. Sadly, Bill put a few feet wrong when he was a union National Secretary: sweetheart deals with employers, that lowered wage rates while gaining benefits for the union organisation. tough Malcolm came to visit Melbourne today, to savage Daniel Andrews’ govt for “failing to deal with gang violence in Victoria and particularly Melbourne”. Strange that. I thought policing was a State responsibility. Mr A, yes, policing is State issues, same as schools and hospitals. So was tough Malcolm overstepping the mark playing politics with Laura Norder? Let’s open a book on which standard Lib/Coalition issues/slogans Mr Tough will pursue. I reckon Malcolm has a spring in his step. Thank you Ambigulous but this is Australia and it is 2018. Labor is compelled to do sweetheart deals with employers so as to lower workers’ wages. Liberals are duty-bound to favour foreign conglomerates over Australian small businesses. Nationals, of course, keep up their valiant struggle against those who dare reside in rural and remote parts. The Greens have been invited to visit Australia at their convenience. Two-and-a-third Nation is awaiting the return of their costed policies in response to the lost-and-found ads. Cynical? Yes – and with good reason. Cheers. Oh, well played Mr Bell. You have won today’s prize, sir. GB: Nothing like a nice piece of bitter and twist to start the new yr. Well done. He’s outdone us all JohnD. Stand back and admire the craftmanship. Last year I referred to fears of nuclear war, on thus forum. Another year, we’re all still here. Just shows, I shouldn’t take Pres Trump’s bluster and medua panics so seriously. 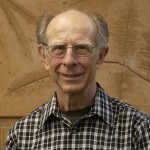 *Frenzies of ignorance: lacking historical knowledge and international relations expertise, let alone military…. and a Safe, Prosperous and Enjoyable New Year to all! No, no. Not bitter and twisted; just angry and disgusted …. But – there is hope. There are opportunities. There is progress. Alright, Jacqui Lambie herself might be out of parliament but, even if she doesn’t make it back herself, then she has inspired many, many “ordinary” Australians. She has shown that they are not as helpless as they seem; that there is a worthwhile alternative to the rabble who pretend to represent us. You, the individual voter, can stand up to the system. Pandora’s Box can’t be closed now. Nick Xenephon’s move into state politics will be, I think, a real game-changer. The recent Queensland election has had the unexpected result of putting fresh life into the new state movement . Campbell Newman’s rule caused it but Anastacia Palaszczuk’s 2017 win will get the blame for it. Never mind, nothing can stop the new state (or states) now. Plenty of hope. Plenty of good opportunities.